A beautifully appointed villa, set within tranquil lush grounds, steps away from a white sand beach, and facing sunset sea views. Amenities satellite LCD TV, DVD player, WiFi broadband internet, full air-con, fully equipped kitchen. 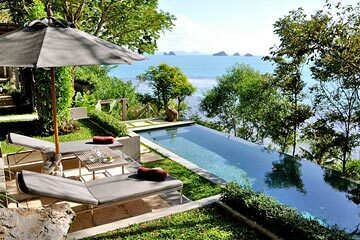 The Headland Villa 1 is a stylish hideaway perched on a steep incline overlooking breathtaking sunset sea views over the west coast of Koh Samui. This 2 bedroom home features an infinity-edge pool, and stairway access to the white powder sand beach of Taling Ngam. An enticing collection of artifacts and tasteful attention to detail combine with picturesque natural setting in this idyllic holiday home. This fully air-conditioned villa is set within beautifully landscaped grounds at The Headland, including mature trees and lush foliage. A meandering pathway through the grounds leads to stairs that access the pool area and house. The property is designed in a single, thatch-roofed building, with white interiors, vaulted ceilings, and foldaway glass walls. The 3 adjacent rooms all open onto a shady verandah that can be closed off using built-in screens. The 10x2.5 metre infinity-edge pool includes an integrated submerged bench seat and a deck furnished with a parasol and sun-loungers overlooking the stunning sea views. The garden continues to a patio with outdoor lounge, ideal for enjoying the views of the scenic five islands at sunset. Light and airy, the double vaulted open-plan living room features a comfortable lounge, an elegant dining set seating 8, and a designer kitchen. At the rear, a metal staircase leads to the mezzanine TV lounge, with LCD satellite TV/DVD, sofa, and a desk. The 2 en-suite bedrooms both feature great sea views, built-in wardrobes, and indoor-outdoor bathrooms with garden rain-showers. The master bedroom opens onto the pool, and is furnished with a romantic four-poster bed, veiled in white netting. The adjacent second bedroom has twin beds. The Headland Villa 1 presents a tranquil and picture-perfect location, steps away from a quiet and scenic beach. This intimate property is ideal for a small family, honeymooners, and friends. Complimentary WiFi broadband internet is included. -Airport transfers are charged at $50+ USD per trip, and subject to 7% tax. Return airport transfers are included for stays in 2018. 5% discount for booking made 120 days or more in advance. Not applicable for Xmas/NY, and only valid at full occupancy rates. Located on the West coast of Koh Samui, 15 minutes from the ferry port of Nathon and 35 kms from Samui’s international airport. Santiburi Championship golf course is 30 minutes drive away. Restaurants and spas are within walking distance along the beach. Learn to cook Thai cuisine in the villa’s kitchen, with training by an accredited teaching chef.